dVault™ Private Delivery Boxes provide intelligent, secure delivery of packages and mail for the age of the Internet. With the dVault™ Collection Vaults, the carrier can deliver a package without signature, and the package remains secure and protected from elements and tampering until the owner can retrieve the delivery. The dVault™ information system software provides electronic or email notification of package delivery. 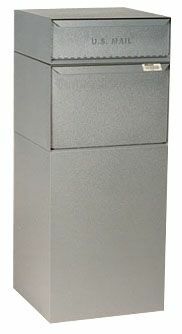 Combined, the dVault™ product line offers a unique solution for homeowners, commercial buildings and governmental agencies seeking a smart parcel bin. The dVault™ Information Systems (DIS) provide automatic date and time-stamp delivery notification, electronic signature/release, tracking and numerous reporting functions. Our patented systems provide merchants, shippers and consumers with the information they want and need utilizing capital equipment and information infrastructures already in place. U.S.P.S. approved dVault model DVCS0015 has been design engineered with the primary purpose of accepting the delivery of packages and mail. 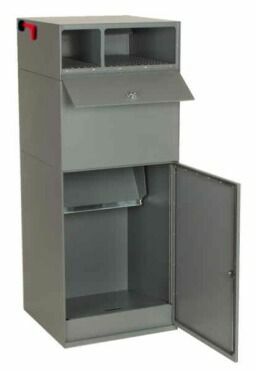 This model features a locking letterbox and an outgoing compartment. Constructed of heavy-duty 16 gauge steel, these vaults are for parcels only. Rear access doors are provided with key locks for security. dVault products provide package and mail deliveries with assured security. Never worry about package theft again. dVault products eliminate redeliveries and do not require that you be present for couriers. Options for all vaults includes the availability of rear code-locked access doors. All models are also available in custom colors on orders of 100 or more, call for details.